Here, Andrew Zimmern shares his best tips for making ice cream at home, from what tools to use to his favorite ingredients. The bowls of plug-and-play electric ice-cream-makers take a day to freeze. I have two for bigger batches and I store them in the freezer. Speaking of COLD, keep your ice-cream mixes in quart containers in the fridge overnight before mixing so they are cold, too. I have multiple freezer bowls because I don't like to overfill my machine. I don't want too much air in my ice cream, but an overfilled bowl won't mix well. If you are tempering egg yolks for custard-based ice creams, use as little hot cream as possible (quarter cup) in the yolks before whisking them back into the rest of the cream. Otherwise you will scramble your eggs. Work slowly with this process. 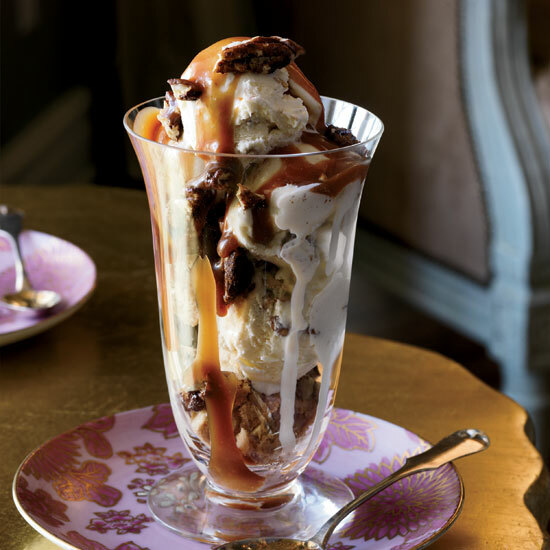 Adding booze to your ice cream will keep it softer, but don't use more than a few tablespoons; it will make it too soft and too boozy-tasting. And use good ones. Lebovitz got me hooked on adding kirsch to many fruit-based ice creams and I often use just a tablespoon. If you use extracts and you want the strongest flavoring from them, add them to the machine with your super-cold ice-cream mix right before churning. Mix-ins should be added during the last minute of churning or by hand after churning. I use KitchenAid and Cuisinart machines, countertop models, and I love them both. I use shallow, plastic, rectangular tubs for storing ice cream. It cools faster going into the freezer and tempers faster coming out, and they stack better. I eschew processed foods in my eating life, but I use corn syrup in some ice creams and in some cookie recipes to allow for better textures. Gelatin also works wonders for texture, but be prudent. I don't use stabilizers.